My father’s work centered on exporting Ban De Soleil which did not provide enough sunscreen and helped me tan…. I wish my mom I hope my mom did not know about all of the times that I hid my tan. Honestly, I think she must have been able to see through the J & J Baby Powder I often applied on the way home from a too sunny day at the beach. Her adamant anti-tan stance was certainly strong and right. Although, as a teenager—or even young adult, I never acquiesced and always argued against her anti-tan campaign. This is definitely on the top ten list of “Things I Swore I Would NOT Do When I Became a Mom, But Now Do with Conviction.” Except, I recently got caught falling into that old, bad tanning habit. I was inspired to write this particular post last week when a kind, unassuming woman who seemed to be about the same age my mom would be (80 ish) commented on my tan. I was waiting for my son when she walked into the doctor’s waiting room, smiled at me and said, “Oh, what a pretty tan you have.” How could she know that her comment would incite guilt. I had not even realized that I have a noticeable tan. I looked at my arms and saw my soccer mom’s tan. It makes sense that the sun’s rays have pierced through my sunscreen given the many hours I’ve spent on the sideline. I felt my mom’s reprimand from years ago and replied, “Oh thank you, but I think I’d better be more careful when I watch my son play soccer.” Not intending to play devil’s advocate, she interrupted my confession and continued to compliment my “lovely color.” Then, she re-directed our discussion to questions about my son and his summer soccer. Soon I was entranced and enjoying the attention and her interest in me and my son. I wish my mom knew how much her wisdom would inspire me. While I did not have the chance to admit to her that she was right about the tan (and obviously still need to be reminded), I think that she must have seen my powder cover-up as a sign of guilt and acknowledgement. “There’s no place like home. There’s no place like home. No place…..”* I am sure that many young campers empathized with Dorothy in the past the few weeks. I hope, by now, sleep away camps are filled with young children who have turned that phrase around and feel that there’s no place like camp. Last summer I wrote about “Those Summer Days” (https://iwishmymom.wordpress.com/2011/07/20/those-summer-days/) of my youth when I was sometimes thrilled to be at our swim club and sometimes overwhelmed with boredom, but never, ever envious of children at sleep away camp. In fact, the one summer I did attend sleep away camp, I suffered with extreme homesickness for the entire two week session. I can still feel the angst and sadness I endured when my parents said goodbye and drove off to Niagara Falls. “How could they leave me and go so far away,” I wondered over the ensuing 14 days of misery. I must have been almost delirious because I cried and screamed, “I need the nurse…let me see the nurse” as the Camp Sacajawea nurse attempted to comfort me. Eventually I settled into the camp routine, accepted my predicament and even decided to enjoy camp. The postcard my parents sent from their trip made me sad, but also gave me hope that they would return. As I hear stories of homesick campers, I wonder if my mom had a difficult time leaving me or if she drove off with that all-knowing parent confidence that I would endure and even triumph over my fears. And, I wonder why I was so homesick. Was I just too young to go to sleep away camp? Would I have thrived there if my parents had waited to send me? I do not think I was overly attached to my mom and I had watched my best friend leave for sleep away camp without any hesitation. I should have been able to adjust. My mom had the right intentions—why wouldn’t I enjoy the same camp that my sister (2 ½ years older) liked the year before? Even after my own children became day campers, I questioned the necessity of this all-day and sleep-away camp experience. I never even liked day camp (I was one of those children who couldn’t learn the camp bus songs. Fee Fi FoEeeny meeny desoleeny was too confusing for me), but I knew that my daughter needed to have summer days full of scheduled activities. After first refusing to even tour Willow Lake Day Camp, she agreed to meet with the director. A few minutes later, my seven year old baby girl wanted to sign up and started counting the days until camp started. And, nine summers later, she is now a counselor helping first and second grade girls cope and even thrive while sleeping at Camp Poyntelle for 7 weeks. She is distracting them, helping them miss and write to their parents without too many tears. I am so proud of her and think back to how her first grade leap to Willow Lake paved the camp road for her. Contrary to my daughter’s desires, my son has chosen to stay home and play sports each summer. He happily attended a week long sleep away camp for a few summers, but chooses playing a sport over leaving home. How fortunate that two siblings who each wanted very different summer situations have been able to have what they desired. How nice that after my 2 weeks of misery, my mom knew to wait until sending me away again. *Baum, L. F. The Wonderful Wizard of Ozz. New York, NY: HarperTrophy, 2001. I am, according to Psalm 128:2 in The Old Testament. What matters, my Grandma Ray taught me when I was very young, is that you are rich if you are satisfied with what you have. My mom’s mom, Rachel Shapiro Tabak, was a very special woman who lived to be 93 years old. I was reminded of this particular phrase/lesson this past Friday night as my Temple’s Cantor spoke during his retirement service/celebration. After 45 years as an exceptionally inspirational clergyman at Temple Shaarey-Tefilo Israel, Cantor Theodore Aronson gave those at services yet another lifelong lesson. Grandma Ray’s philosophy and attitude had a great impact on me. She was an inspirational “other mother.” I am sure I did not appreciate my own mother telling me to be satisfied with what I had. She is the one I bugged to buy me another pair of designer jeans, another sweater…. How often are young or teenage girls satisfied with the “things” they have? But, when my Grandma quoted the Bible, I listened. She made sense. “Who is rich? He who rejoices in his portion, as it is written (Psalm 128:2) ‘You shall eat the fruit of the labor of your hands; you shall be happy, and it shall go well with you.’” (from http://www.shechem.org/torah/avot.html) My Grandma made me feel good—like I was in charge. I could be whatever I wanted to be. If you enjoy the life you created, if you do your best to create a wonderful life, you can feel good. She never went into that much detail, all she had to do was quote the Psalm and I understood. My Grandma had a very hard life. She fled Eastern Europe in the 1920s, following her husband to America. After a difficult, almost impossible journey via Cuba, she settled in with her husband who was already in New York. She continued to have personal and financial struggles. I am not really sure how she was able to endure the hardships she had. On paper, she was never even close to being rich. But, what was in her mind and heart made her a billionaire. This saying puts the onus on us to create a life we love, no matter what we have. How many “rich with money” people do you know who are not really rich? I could feel “poor” because I don’t have my parents. I am deprived of their support. I could feel entitled to pity. But, I don’t feel poor. I feel fortunate for the parents I had. There are many worse alternatives. I know that. “Other Mothers” (Post from Sept. 1, 2011- http://wp.me/p1lBgS-4f) are all around us, they can be our grandmothers and clergy. I really must credit my Grandma Ray for empowering me to accept reality, the lot I am given, and do the most that I can with it. I appreciate Cantor Aronson. He is grateful for the richness he feels. And so was my Grandma. And, thanks to people like them, so am I.
I readily admit that sometimes my longing for my mother is triggerd by my own needs—wishing she could do something for me. Rather than feel guilty about this selfish desire, I rationalize that the nature of the child/parent relationship is about what we do for each other. Right now, in my teenagers’ lives, I do so much for them. I do not expect a “pay back,” but I hope to experience some reciprocity. More importantly, it is a goal, however idealistic, that as parents who do many things for our children, we ultimately teach them to do these things for themselves. 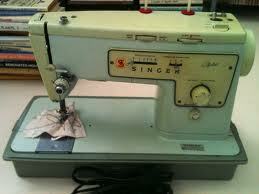 Why is it, then, that I did not learn how to sew? There is even more I could have/should have learned from my mother, including basic handyman skills and shopping for antiques. She could hang any frame on a wall, drill holes and hang shelves as well as find valuable antiques and sell them in her shop. And, this is just a partial list of skills she had and wished to share, but that I refused to learn. What I wonder is what special or even ordinary skills you learned from your mom. Which of her talents did you take for granted or refuse to adopt? If you could be her apprentice now, what do you wish she would teach you? I was reluctant to write a post about the very recent death of my Aunt Joan, my father’s sister. She requested and had a very small funeral on March 13, one day after her death—there were just 10 of us. I’m sure she did not want to draw attention to her demise from emphysema. My sister and my aunt and cousins (from the “other side” of the family) shared sentiments and sadness via phone calls and e-mails as we grieved. As I thought about her and our relationship, I recalled mentioning her in a few posts and even giving her a spotlight when I wrote about my Other Mothers . I soon felt compelled to share my thoughts about her and honor her with a post. After a complicated kinship with my aunt: living in the same neighborhood for most of my childhood, sharing holiday celebrations, family feuds that lasted years, we settled into a comfortable and reciprocal relationship. After my father died, I could not wait to sit with her and make sure I knew details of his childhood and early adult years. At age 23, I was eager to have adult conversations with my dad, to get to know him on a different level, but it was too late. Aunt Joan was the perfect substitute. And, she enjoyed reminiscing. While she was distraught over my mom’s illness and death, she did not heed my mom’s request that she quit smoking. That remained a sore point during my mom’s last few years. Her diagnosis of emphysema 8 years ago gave her no choice but to quit smoking and shocked her into the reality of what she had done to herself. I am glad she did not choose to be angry at herself and instead just accepted the fate she brought on. A few weeks after starting my blog, I told her about it. Honestly, I was nervous she would be offended that I chose to write about my mom and not her brother. Since she never became comfortable with technology, I printed and mailed her the posts I had written. Her response overwhelmed me—she loved what I was doing. She immediately understood the need I had to explore my bond with my mom. Her mom, my Grandma Lena, lived to be 93 years old and she still thought about and missed her every day. So, another void opened with this passing of one of my “other mothers.” I almost did not write about her and now I can’t stop. This is just my point, we sometimes wait too long to think about people who have been a part of lives forever and the impact they have had on us. Yet, it is never too late to appreciate them—and even write about them. Holidays are known (notorious) for triggering sad memories of family missing in our lives. So, of course I have been thinking about my mom and, yet, fortunately focus on memories of celebrating Chanukah with her. My thoughts rambled and I came up with one memory or lesson for each night. 1. Lesson, learned very young: Chanukah is NOT as important a holiday as Christmas. I grew up knowing that Chanukah celebrations mimicked Christmas due to societal pressure. My parents were dedicated to recognizing the holiday and carrying out the standard rituals, without Christmasizing it. Even as a child, my parents somehow helped me feel that the story of the Maccabees, lighting the Menorah, dreidel games and latkes were more important than gift-giving. 2. Gifts for Children Only: My mom was adamantly opposed to children giving Chanukah gifts to adults. They were happy to give us gifts, but believed the gelt-giving tradition was intended to be non-reciprocal. As a child and young adult, I might have felt relief at being spared the expense and shopping agony, but the true test of admiring this “rule” is that I pay it forward—I am very happy to not receive gifts from my children and I am truly happy to give. 3. Chanukah gifts: Not usually bountiful, but, even in tough years, my mom and dad gave us each one gift we requested. They joked that if we wanted one gift each night we’d have to settle for Crayola’s box of 8 distributed over the holiday. Rebelling against this and starting with my daughter’s first Chanukah, I decided to indulge my children the way I wish I was…. Whether it is a relative’s, friend’s or our gift, I make sure my children have at least one gift to open each night after we light the candles. 4. Shopping for Sales: We often waited to buy gifts until the Old Bridge Drug Fair lowered prices hourly before closing on Christmas Eve. Sometimes we even ventured to Toys R Us the day after Christmas for the best sales. Some years our gifts were delayed until the monumental sales began. It was, of course, more fun to go when we had already been appeased with Chanukah gelt and gifts and the trip filled our rooms with extra toys. One problem with my parents’ plan is that I do recall being really sad in the Barbie aisle when NOTHING was reduced. Those were the days of fewer sales and deals. As an ardent sale shopper, my mom would be overwhelmed with today’s current state of sales. I wish my mom could have seen Target on Dec. 24, 2011! 5. Better than any gift: My parents’ surprise announcement just before the holiday—we’re driving to Florida. I wonder how crazed the last minute decision made my mom—preparing for the long car ride and stay in Miami or Orlando. I knew the reason for this surprise was due to either a bonus paycheck or some other “found” money. The impetus did not take away even one bit of the euphoria I felt when the trip was announced. 6. Grandma Ray’s latkes: I can see and smell them now—meaty potato patties coated in heavy oil and fried until all of the oil soaked in. During holidays my mother lifted her usual ban on my Grandma’s food treats. My grandma was even allowed to bring the fruit slices, sweets I still crave (and must admit, buy). 7. Dreidel games: I often think about the very simple fun my sister and I had while playing dreidel on her floor—before her 1970s green shag carpeting was installed. The tiles were a drab and cold brown during the winter, but spinning for pennies (or even luckier, Hershey’s Kisses) was a tradition I relished. I still have our plastic dreidels, the bigger shallow dreidel that held the tiny ones and the piece of paper reminding us how much gelt we give or get from each letter. 8. Keeping it simple: In keeping with the effort to celebrate Hanukkah in a non-Christmas way, we had very few decorations. The most significant symbol of the Macabee miracle was prominently displayed—a brass electric Menorah in the window and an old-fashioned brass Menorah in the family room. I have proudly displayed the same electric Menorah, my Grandma Ray’s candle menorah and one that we received as a gift. I must admit I have decorated with Chanukah ribbon and streamers and use napkins decorated with Hanukkah symbols during the 8 days. I wish my mom could see that she taught me well and her guidance/lessons live on. Happy Hanukkah! Special thanks to my sister for helping me with accurate recall! Now go read a wonderful Hanukkah Hoopla post by The Culture Mom ! I would like to thank Streit’s and Doni Zasloff Thomas a.k.a. Mama Doni, the lead singer/songwriter of The Mama Doni Band for providing each of the 16 bloggers involved in #HanukkahHoopla with a little cyberswag. How can you win? Leave me an awesome comment. On January 5, 2012, I will select one winner at random. Be sure to subscribe to my blog or subscribe to comments on this page so you can find out if you are the winner! If I don’t hear from you within 48 hours, I will select another winner. Prefer to be contacted via Twitter? Leave your Twitter handle in your comment and I will tweet you if you win. Not interested in winning? You can still leave a comment! I love to read your words. Just write: “No prize necessary” in your comment. Don’t make me work too hard to find you. That will make me kvetchy. Oy. College Road Trip –a long and winding road. As I and my family become immersed in the frenzy of my daughter’s college application process, I wish I could talk to my mom about my senior year, her coping mechanisms and just get that re-assurance that it will all work out. My friends (my colleagues in Parenting, Inc.) and I discuss how much this whole college search and application process has changed over the last 25 – 30 years. We all agree it seems much more grueling. Like so many other things in our lives, it is more complicated and competitive. We can’t really blame this change completely on technology, but the fact that a tremendous amount of the planning and applying takes place on-line, makes this another task we can obsess about 24 hours a day! There are some important similarities I recall about my own experience. We think that our teens go overboard with tutors and counselors, but even I had a few appointments with a college counselor to help me figure out what I might study and where. College visits/ road trips were all exciting. I enjoyed visiting Tufts with my parents and actually recall walking around the campus with dreams of a 4 year stay. I also remember the Reuben sandwich I enjoyed when we took a break in Boston’s Faneuil Hall. My mother and I enjoyed a long car ride to Cornell and then survived a scary ride home in a white-out snowstorm. I remember being thankful for my mom’s willingness to stay in a hotel while I camped out in a dorm room there. My most vivid memory is actually a regret. My final decision to attend Rutgers College makes me proud, but I never shared the exact reason with my parents. After Tufts and Cornell rejected my application (easy to say now, a horrible feeling then), I had to choose between Brandeis and Rutgers. Even after meeting with my lovely counselor, I was still unsure of my career path. I thought I should follow my sister’s grand footsteps and consider law or a similar, highly respected career. At the time, teaching was not the popular choice. Salaries were still low as was the esteem, or so I thought. Yet, somehow I knew that I might choose to be a teacher. And, so I privately decided to opt for the less expensive education, I started out majoring in economics and taking courses that were not right for me. Fortunately, Rutgers was the perfect place to alter my path and follow my true calling to become an English teacher. I wish I could tell my mom and dad about my secret decision, but I also think they might have known. Most importantly, I still get chills as I recall their show of approval and support of my decisions. I know I made them proud! So, now back to my current journey as the mom of a college-seeker. And, since I do not recall my mom nagging me to edit college essays and finish applications (most likely a selective memory loss), I aspire to be the supportive and understanding mom. How about your experience, then and now? I would love to know your story—it might just help this current journey.